Intended for up to 8 people when traveling for 3-7 days and medical help is 24 hours away. 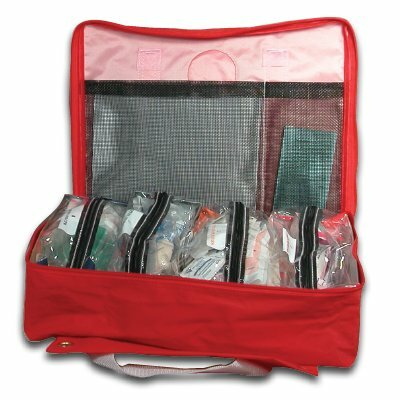 5 modules filled with a wide variety of first aid and medical supplies. The waterproof manual details contents of the bag and treatments you will be able to provide. Grommets make it easy to hang this case anywhere. The contents of this 12"H x 15"W x 4"D cloth bag are organized into five clear modules. For easy replenishment, see Fieldtex Day Pak Module Refills. Subchapter M for inspected towing vessels. 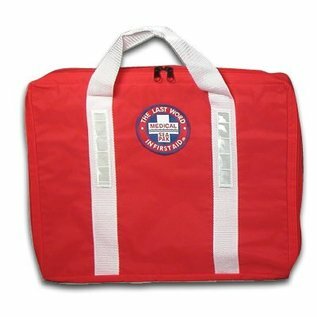 The regulations call for an “industrial” type first aid cabinet or kit. We think the Fieldtex Day Pak, Excursion Pak, and Coastal Cruising Pak meet that requirement, and are suited to inland operations. 25 Bandages 1" x 3"
6 Insect Bite Relief Swabs (singles) 6"
15 Bandages - Strip 1" x 3"
2 Dressing Pads 5" x 9"
3 Splint - Finger 1" x 6"
1 Color coded, waterproof, with the patented "First Aid By The Numbers" design.